When my oldest was a baby, I practically demanded a prescription for every cough and sneeze, without realizing that the use of antibiotics have long-reaching, negative health consequences. 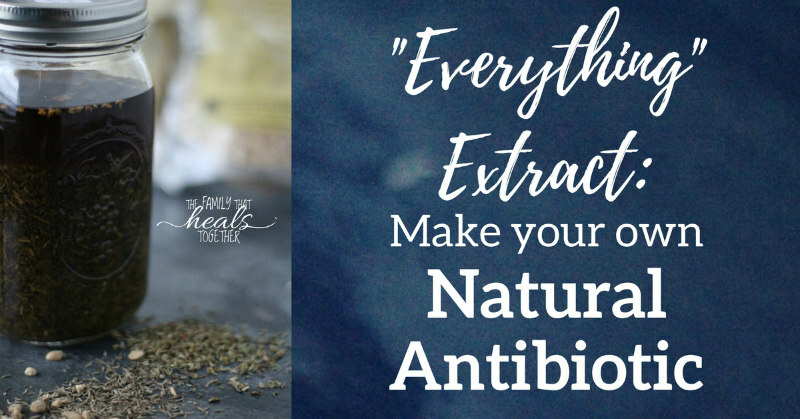 I know now that antibiotics should be a last resort choice when nothing else works… but thankfully, since learning about herbs, I’ve found that there are better options. 1. Antibiotics kill bacteria. Duh. That’s why we use them. But- our bodies are filled with both good and bad bacteria, and antibiotics aren’t picky. 2. Antibiotics cause disease. Because the majority of your immune system is found in your gut, your gut bacteria controls how healthy you are and how well your body can fight off invaders. 3. Antibiotics create superbugs. This is becoming more and more apparent all the time, as drug-resistant infections become more common. Thankfully, there are lots of herbs that are effective for treating a variety of infections and illnesses. Here, I’ve created what I call “Everything Extract” because it contains a few key herbs to target anything and everything. Our family recently used it as part of a protocol for a particularly nasty respiratory infection that went through all of our kids, and it did its part to help them recover. Here’s what you’ll find in my natural antibiotic. Get organic dried ginger root here. Do you know a friend who’d like to hear about natural antibiotic options? Sharing is caring! When you state dried ginger root, does that mean powdered ginger as you would get in a spice bottle? Also, can you use fresh oregano, thyme and rosemary from the garden, and, if so, are the quantities different, as I think the dried herb is more potent? Hi Lynda! You can use fresh, but you’re correct, it won’t be as potent, but that’s ok. This is already a strong preparation, and we just take it as needed, so there aren’t any strict dosing procedures. I’ve linked to a dried ginger root, which has not been powdered, and is better for making extract than the powder. However, if you’re using fresh herbs, you could grate fresh ginger root to use as well. I would think you could make an equally potent extract with fresh herbs if you follow the 3:1, fresh:dried rule. Measure 48 ounces or 6 cups of fresh herbs (half a quart = 16 oz x 3 for fresh herbs) and smash them down into the quart jar until they fill half the jar. To make the Everything Extract, then, you could weigh out 16 ounces of each fresh herb. This might be iffy unless you are weighing the fresh or dried herb rather than eyeballing half a quart Mason jar. What do you think? This looks like an excellent recipe but it wasn’t clear to me if you are using fresh herbs or dried? Are you using a quart jar? This looks great, and I will be making it, but what if I need something now and can’t wait 6 weeks? Plus have some strict financial limits? Thanks! Hi Jax. If we’re battling something acute and need something quick, I like to use store-bought oregano, olive leaf, echinacea, and/or goldenseal extracts. These generally run $10 or less for a one ounce bottle. Do you know if there is someplace to buy something similar? We have something going around here, so I don’t have time to wait 6 weeks. Hi Karen. If we’re battling something acute and need something quick, I like to use store-bought oregano, olive leaf, echinacea, and/or goldenseal extracts. Can you use essential oils for this recipe instead of the dry herbs? No, sorry, Terri. That would be something totally different and I’m not a big fan of internal essential oil usage. I am confused how natural “antibiotics” know which bacteria are bad (therefore killing those) and which ones are good bacteria. I prefer to use natural products, but have never had this question answered. Thanks for your article! That’s a great question. I have read that these herbs leave the good bacteria alone, as herbs work symbiotically with our bodies’ own defenses, rather than wiping everything out like antibiotics, but I’d have to research it further for conclusive evidence of this. Any way to make this with a different liquid? My family does not consume alcohol. Hi Barb. You can process it for as little as two weeks, but it won’t be as strong. Sometimes, if I need something, I’ll leave the herbs in the jar and begin getting some dropperfuls before I strain them out. 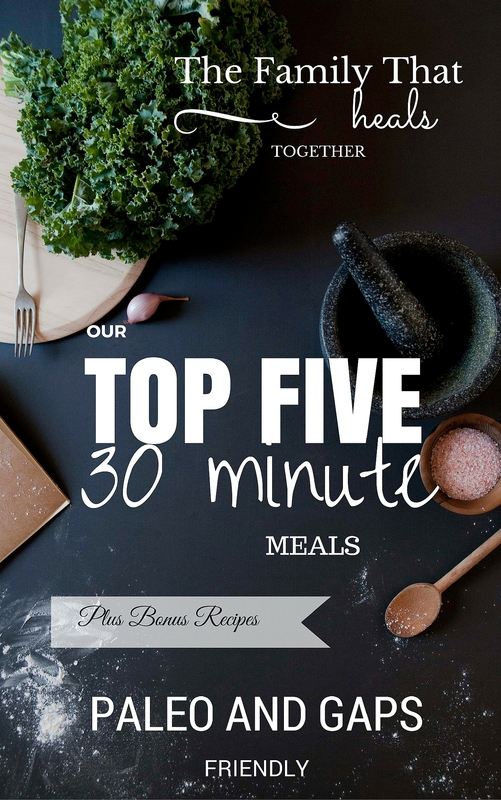 Want to try this recipe, thanks so much for sharing. I have all of these herbs in my garden. Any advice for making this with fresh herbs? Hi Desiree. You can definitely use fresh herbs with this, it will just be a little weaker because fresh herbs are larger in volume than dried so the finished extract will be less concentrated. Hi JingJing. Hope you love it! I grow Oregano, Rosemary and Thyme in my garden. I don’t use any chemicals in my garden. I should be able to use that in making this, yes? Hi Sarah. 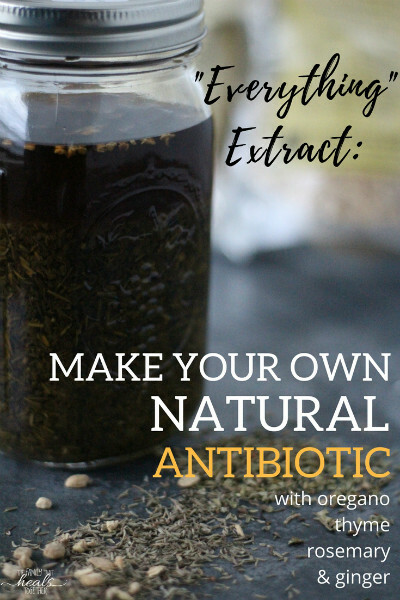 You can definitely use fresh herbs with this, it will just be a little weaker because fresh herbs are larger in volume than dried so the finished extract will be less concentrated. How long does this last and where do you store it? I am kind of “geeking out” because this is one of the first healing recipes that I commonly have almost all these ingredients on hand. Is there any more information to consider when making or deciding when to use that should be taken into ac count? It really should last indefinitely. We use it for general immune support during various illnesses. What do you think about heating the mixture after it has infused with the herbs, maybe after all 6 weeks? Any opinions about wether that would get rid of the alcohol, but still leave an effective concoction? My guess is that heating the extract would destroy some of the herbal constituents and render it at least less effective, but I’ve personally never done it. As a physician, I was concerned to read that you use your extract to treat strep throat, which can cause rheumatic fever and damage to the mitral valve of the heart. This is a great concern especially for kids who tend to pass strep throat around a lot. Hopefully you give your kids allopathic antibiotics as well for true streptococcal pharyngitis. The medical history of strep pharyngitis is simple and clear: suitable antibiotics prevent morbidity and mortality from strep. Herbal extracts cannot do that. Herbs can, indeed, treat strep bacteria. Otherwise, surely everyone who came down with strep before the age of antibiotics must’ve died, and I don’t think that’s the case. Antibiotics are not without risk and one should consider and weigh their options. My country is hot and humid. Can I store the mixture in the fridge instead? You probably don’t want to make the extract in the fridge, as it would probably slow down the process. As long as you use a tightly sealed jar, you shouldn’t have any problems. How exactly do you use it? How often and how many dropper fulls? I take a dropperful or two in a little water, depending on the level of pain, and take more as needed. I love this. What size dropper bottle are you using? 4oz? smaller?